This year, the GRANDE Print Art Fair takes place in the HQ of the Montreal Printed Arts Festival, right in the heart of St-Laurent Boulevard at the WIP (Work In Progress). Exhibits, workshops, presentations of printed art that integrates augmented reality and an evening of Pecha Kucha presentations will take place alongside the Grande. The Grande takes place in an accessible location on the ground floor. This year, the Montreal Printed Arts Festival explores “other” spaces occupied by printed art: the public and the digital spaces. In the public space, the boundaries between printed art and the visual environment can dissolve and open up new possibilities. In the public space, printed art becomes social, itself part of the social space. The virtual space allows the language and aesthetics of printed art to be used in new, redefined ways, within new codes and meanings. The digital technologies that have disrupted traditional practices in recent years are now beginning to provide entirely new ways to create and experiment. The Montreal Printed Arts Festival’s programming is centred around its HQ at the WIP (Work In Progress), 3487 St-Laurent (accessible), where you can take in an exihibit or works by Marilou André and Galerie galerie (April 12-14), a presententation about augmented reality and its possibilities for printed art (April 12), Grande print art fair (April 13 & 14) a Pecha Kucha evening (April 12), an evening of collaborative poster making with Possibles éditions (April 13) and a print workshop for children with Perte de signal and Alexandre Quessy (April 14). A programme of activities will also be held at various partner venues over the ten days of the festival: Vernissage and performance by Emma-Kate Guimond at Arprim (April 6), thematic visits to the collections of the BaNQ in Rosemont–La Petite-Patrie (April 8-9), Artexte on tap (April 10) and the launch of a special project by Ileana Hernandez in the display windows of L’imprimerie (April 11). More informally, the Zocalo art centre will distribute throughout the festival special zines created during a workshop given by Myriam Tousignant and Mélodie Vachon Boucher, and Collectif blanc will curate an online exhibit of projects. For details, consult the programming information here or on the festival’s Facebook page. 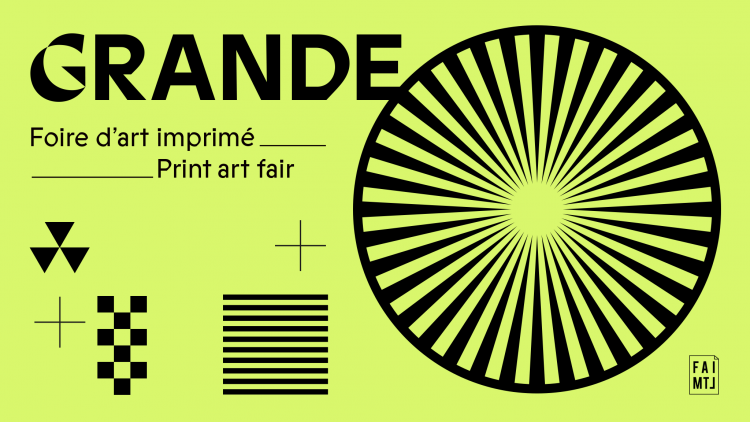 Grande 2019 is an ARCMTL presentation carried out in partnership with the Montreal Printed Arts Festival and made possible in part thanks to the support of the Canada Council for the Arts and the Conseil des Arts de Montréal.